Some of you may be confusedly saying you have Opera on your phone already. There is a difference between Mini and Mobile in that the Mobile browser renders webpages itself, as opposed to the server-side processing done in the Mini browser. This allows for a more personalized web experience as well as greater control over the content visible to you. However, it also requires a bit more processing grunt at your end. To aid in that effort, Opera Mobile will utilize hardware acceleration to render pages more quickly. In addition to this, we'll see full pinch-to-zoom support, which is an improvement from Opera Mini's set zoom levels. 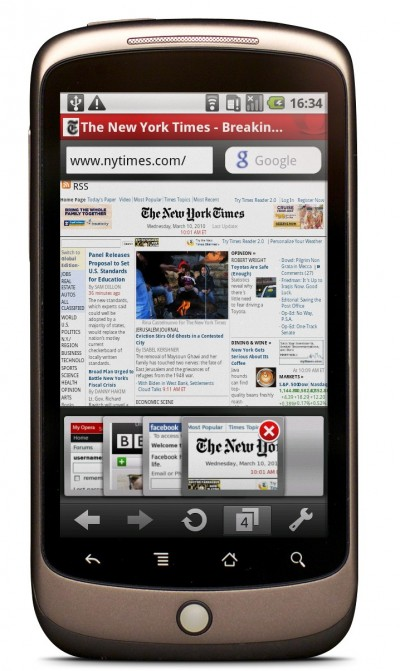 Opera Mobile has long been considered a mainstay of Symbian and Windows Mobile, and it will be interesting to see if Opera, along with Mozilla's Firefox, can make any dent in the market share of the stock browser and its WebKit derivatives. The browser will be available on the market for free upon release.